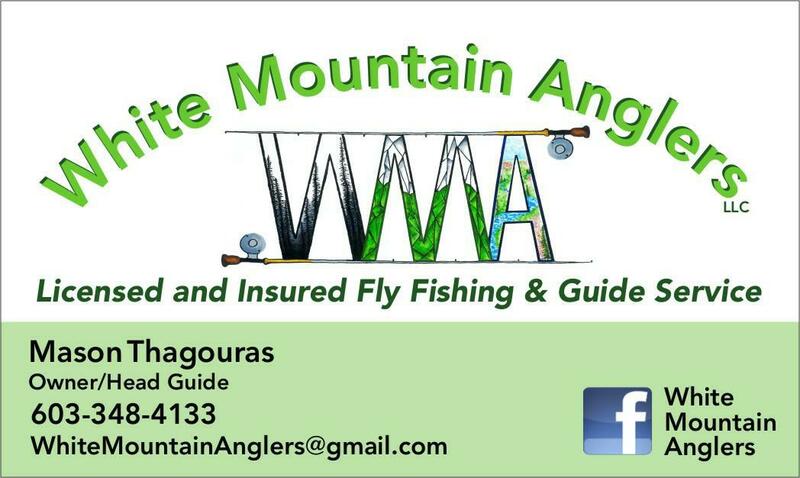 Mason Thagouras, founder of White Mountain Anglers and Registered New Hampshire Guide, offers a wide variety of guided adventures to help you target both the species, and the experience you seek. Either from one of his drift boats or wading along the shores of some of New Hampshire’s finest rivers, Mason has been there, done that and can show you the way. The Saco river is one of New Hampshire’s clear water gems. As it winds its way through the heart of the Conway valley, this fishery offers a variety of fishable water. Beautiful riffles extend into long, deep pools, pools that hold big and mysterious trout. Early season fly fishing for big browns on the Saco River is done during high water on the drift boat, towards the end of spring run off or after a heavy rain. This causes the river to pick up speed and become murkier and gives us the advantage to cast big streamers at these hungry fish without spooking them quite as easily. These’s early season trips can sometimes make for long days and lots of casting, but the reward can be a once in a lifetime trout on the end of your line! Advanced anglers with patience will persevere here. As the water stabilizes and the country begins to thaw, the river warms to appropriate trout feeding temperatures. This kickstarts the bug life – especially the mayfly hatches – with the best being the “Hendrickson Hatch.” The fishing is best accomplished in the early and late hours of the day as the sun fades and both fish and bugs become more active. Wade fishing is great for accessing many of the fly fishing only stretches, creeping the banks to spot hungry, feeding trout. The Saco River has a lot to offer for less experienced anglers interested in learning the craft as NH Fish & Game stocks the river heavily in easily accessible locations, making it a great place to learn to fly fish and bring fish to hand. If you are looking for something more challenging and rewarding it is best to hire a guide to drift the river and cover more water, or be prepared to walk longer distances to hit unpressured pools. Using a combination of stealth and precision, I can show you to catch a big, elusive Saco River brown trout. Fly fishing on the Androscoggin River offers multiple options for float and wade trips, as well as a wide variety of both trout and warm water species. The “Grand Slam” is a common goal amongst Androscoggin anglers, which is to acquire a landlocked salmon, brown trout, brook trout & rainbow trout while out on the water. Another highlight to fishing this river is its unique and prolific Alder fly hatch, which provides great dry fly action as fish gorge on swarms of Caddis hatching by the thousands for miles of river in mid June. The Errol dam and the upper section of the river is also excellent for float and wade trips during this period. The Shelburne section of the Androscoggin is an intriguing peace of river due to its Catch and Release regulations, low fishing pressure and is not stocked by New Hampshire Fish & Game. This allows for an opportunity to fish a more wild trout fishery which produces beautiful strong fighting Rainbows and Brown trout. The Androscoggin also offers the opportunity to fish for warm water species like Large & Smallmouth Bass as well as Chain Pickerel. These are often a great option when the river warms in the heat of the summer and we take advantage of the slow water portions of the river above Pontook Dam and stretches of water above Berlin, NH. This provides an action packed day consisting of streamer and top water activity great for the new and experienced angler. Small streams fishing in New Hampshire is one of the best activities for those who like remote walks in the woods and local trails along countless cold water streams in the north country. If peace, solitude and nature are your things – this type of fishing is for you! These fisheries become very active in early season (April-May) and late season (September-October) while the water is still at an appropriate temperature for active trout. Small stream fishing is a good as it gets for New Hampshire’s Native and Wild Brook trout. Even with their smaller size, at 4-10 inches, they make up for there size with their aggressive feeding behaviors. These fish rarely hesitate to grab food as it drifts by making for great dry fly action as you rock hop from pool to pool. Beginners and advanced anglers alike find this to be a consistently fun and action packed trip! 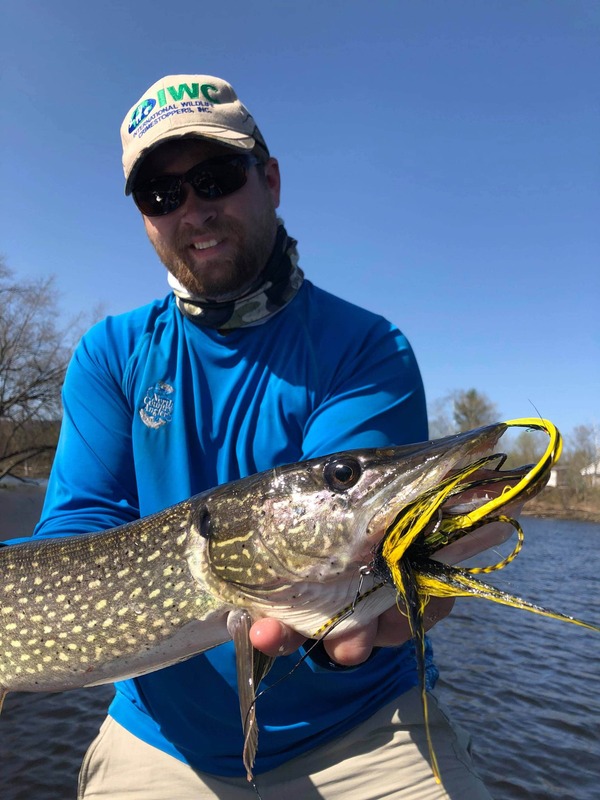 Fishing for Northern Pike and Bass on the fly is a somewhat new and growing sport in the world of fly fishing, and New Hampshire has some great opportunities to hook into these aggressive and hard fighting warm water species! Bass can be targeted by fly anglers in many NH rivers and small ponds in the north country, by both boat and on foot. Some of the best casting is experienced on our local ponds from the boat, working along weed lines and structure with a mix of big streamers, jig flies and when the timing is right, poppers! Seeing a large fly getting inhaled by a gaping mouth, setting that hook, followed by an intense fight is what makes fly fishing great in the first place. Taking advantage of this fishery during the warm parts of the summer when trout fishing is slower ensures we offer the best opportunity to get you into fish anytime of year and keeps our coldwater species from seeing too much stress. Pike on the fly is always a challenging feat that rewards anglers with good casting ability and patience to track these freshwater apex predators. The Connecticut river is one of our primary fisheries for these species which we access by drift boat, covering slow winding stretches of this river as well as the “lake” in the river known as Moore Reservoir. Although pike are thought of as a warm water species, they can be especially active in the early season as they spawn in shallow water and look to feed on baitfish or anything that will fit inside their mouth. Pursuing Pike with a fly rod is no average fishing trip, pike are known to be fearless fish with ambush like feeding behaviors, but do not be fooled, these fish do not get as big as they do being stupid. If you are to have one of these beast strike – you will have to put in the time. Casting massive streamers on floating and sinking lines on a bigger rod setup is not an easy task and requires a good casting ability. Yet, when you finally feel the take, or see a torpedo like silhouette intercepting your fly, it’s a heart pounding experience. This is where big game hunting and big game fishing collide! The Connecticut river is one of New Hampshire’s best cold tailwater fisheries, renown for its large Brown and Rainbow trout. Float fishing on the Connecticut can prove an effective and efficient way to cover miles of river that normally isn’t easily accessible by foot.